December 2012 saw three per formances of The Sprout of Destiny, the third and final instalment of the Mince Pie of Doom (Dun Dun Dah) saga, and now the characters and cast have been put out to grass, never more to return... this web site is now a memorial to those brave souls who fought their way through the script, not once, not twice but three times and now they are done. It is a testimony to audiences up and down the land (well Bromsgrove, Redditch and Droitwich at least) who despite therapy and counselling, returned for more year after year. So that’s it then, no more Holly Noel and Ginny Pinny, farewell Auntie Freeze or Ruby Tuesday. All done, fini, The End. 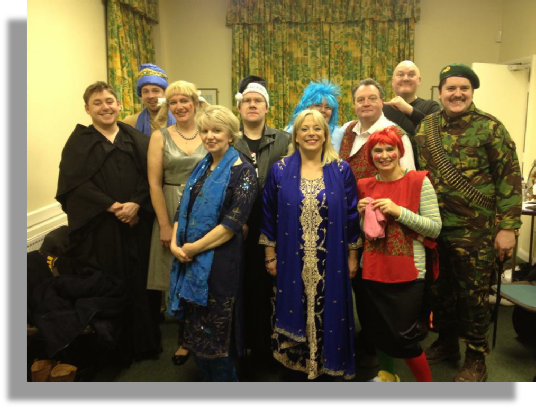 DECEMBER 1 is traditionally the day when many people start their countdown to Christmas and that was no exception in Droitwich on Saturday, when the Avonmill Players served up the third helping of The Mince Pie of Doom at the Norbury Theatre. Along with the opening of the first Advent calendar door and the annual putting up of the tree, this year, there was also the first performance of The Sprout of Destiny. And judging by the audience's reaction, the final instalment of Richard Walter's and Simon Baker's trilogy was seasonally greeted as a stage success. You would struggle to find a show with more one-liners and they had those who went along either laughing out loud or groaning appreciatively as each witticism hit home. The action was centred around Detective Holly Noel combating the evil forces of panto-esque baddie 'Auntie Freeze', who was making her third attempt at abolishing Christmas. There were some fantastic performances across the board from this very talented cast and the Christmassy chemistry between the characters was a joy to behold. Graham Forbes was typically solid in his role as Holly Noel and struck up a real rapport with both his fellow actors on stage and those watching as he contemplated his cases from his past, present and future that he had been presented with. Other fine performances included Shaun Knowles as Krampus, with his comic Billy Connelly-style accent, and Cathy Stokes as Brummie cleaner Ginny Pinny who was undoubtedly an audience favourite. Among the memorable moments in the plot were the arrival of the two writers on stage - Simon Baker as German Gestapo officer Herr Nick and Richard Walter as the archetypal sergeant major, and humorously named, Major Eyeswater. And the scene when Ginny's family - Vinny Pinny, Linny Pinny, Winny Pinny and Frank Pinny - turn up also generated plenty of guffaws from the crowd. This feel-good festive feast of theatre is well worth a watch and the final performances of it take place on Friday and Saturday (December 7 and 8) at the Trinity Centre in Lickey. The Mince Pie of Doom started as a stage play in 2009 written by Simon Baker and Richard Walter, and brought to life by Avonmill Players. It was revived in 2010 as a radio series as well as a stage play and then sequel has been released into the wild - lock up sensitive pets, especially reindeer! If you have no idea what is going on then you are in good company with the actors, the writers and Holly Noel himself. To catch up with the story to date visit the “story so far” page. Or for a real treat visit try the MPoDcast page to listen to the radio episodes.